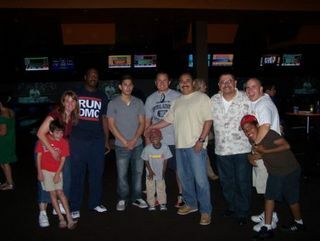 The Bowling Night Fundraiser at 300 Pasadena on Tuesday, June 1st, was a resounding success! So far, the Altadena Sheriff and the Central Altadena Little League (CALL) have raised $4,100. A great time was had by all and it was truly a pleasure to witness the deputies working with the kids. The kids are still talking about it. Special thanks go to Deputy Marcos De La Riva and Captain Steven McLean for organizing a great event. The top fundraisers will receive prizes donated by the Altadena Sheriff's Station. We will announce the top fundraisers at our closing ceremonies this Friday, June 4th at 7:00 p.m. at Farnsworth Park. Additionally, the CALL is having an MLB Raffle Ticket Fundraiser! Thanks to a very generous donation from CALL parents and Altadena residents Mr. & Mrs. Michael Kealing, the league will raffle off four tickets (parking pass included) to the Los Angeles Dodgers vs. the WORLD CHAMPION New York Yankees game scheduled for Saturday, June 26, 2010 at Dodger Stadium. The tickets are good for four loge seats in right field. Raffle tickets are $20 each and only 200 raffle tickets are available. The winning ticket will be drawn on Wednesday, June 16th at the CALL Board Meeting. The winner need not be present to win. All proceeds from the raffle will benefit the Central Altadena Little League. Raffle tickets will be available for purchase at our closing ceremonies this Friday or interested parties may contact the Central Altadena Little League at (626) 236-4969. Ticket sales end on June 14th. Updated with Dodger game information.